This page is under development. More content will follow shortly. An empirical scientific discipline requires a set of methods and practices for evaluation and comparison of proposed models and solutions. RoboCup provides a unique common test scenario for robotics, but its potential is, by far, not realized. Conducting games incurs high cost in terms of effort, time, and money. The scientific outcome, however, is quite limited and often not very conclusive. In most cases only the final score of the games provides feedback about the performance of a team. 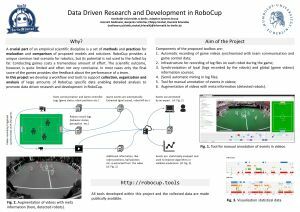 In this project we develop a toolbox (a set of tools) to support collection, organization and analysis of large amounts of RoboCup specific data enabling detailed analysis to promote data driven research and development in RoboCup.